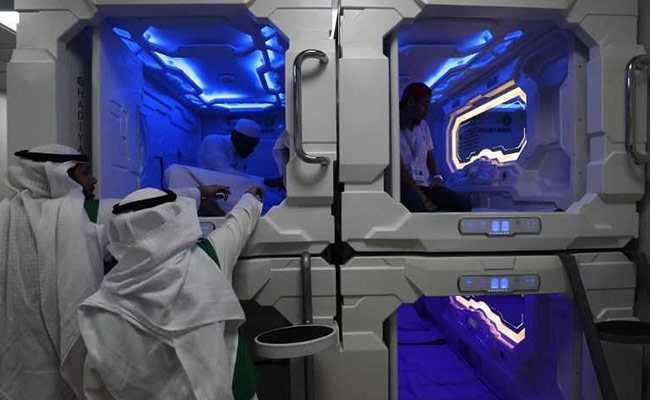 For Hajj, Saudi Arabia Tests Japan-Inspired "Nap Pods"
Mansour al-Amer swipes a card to reveal a narrow sleep pod, reminiscent of Japan's famed capsule hotels. But this pod is in Saudi Arabia, where the Muslim hajj pilgrimage begins Sunday. Each fibreglass pod -- less than three metres long and just over one metre high -- features a mattress, clean sheets, air conditioning and a large, well-lit mirror. When the pilgrim wakes for prayer time -- five times daily in Islam -- workers will sterilise the pod before handing it over to the next pilgrim. "We believe it's extremely well-suited for crowded places in our holy sites and in Mecca." But for hajj, which takes pilgrims across Mecca and Mina -- two cities in western Saudi Arabia home to the holiest sites of Islam -- the pods were also inspired by the rising popularity of car- and bike-sharing. The hajj presents the Saudi authorities with major logistical challenges, as Islam is currently the world's fastest-growing religion, according to the Pew research centre. Saudi authorities are pushing a "smart hajj" initiative to meet with the growing demands of hajj, which coincide with the kingdom's unprecedented modernization drive. Saudi Arabia, one of the world's most restrictive countries, this year lifted a ban on women driving and has seen a string of reform initiatives spearheaded by the powerful young Crown Prince Mohammed bin Salman. But the kingdom has also tightened its grip on dissent, with around a dozen women's rights campaigners arrested in recent weeks. Some have been released. Eid al-Adha includes the slaughter of sheep, with the meat distributed to Muslims in need. The ritual symbolises Abraham's willingness to sacrifice his son, Ishmael, on the order of God.